When Nina's came to the Abingtons, I was super excited because I have long enjoyed their wing bites and supersized hoagies at their other locations. The newest location is in the former Thick and Thin Pizza building next to Monroe Muffler and JJ Bridges. They've been in business in Clarks Summit for about a year now and I've paid quite a few visits both via takeout and delivery. 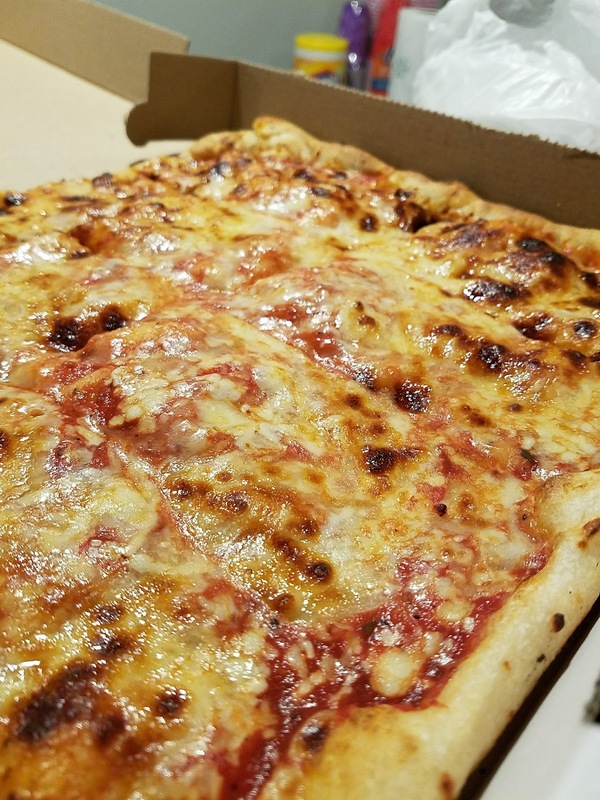 I have to say, the wing bites and hoagies are still my favorites, but the pizza is definitely worth a try as well. This location only offers takeout and delivery, unless it's summer time when they set up a few outdoor tables. The place is pretty clean and simple, and so is their strategy: buy local, make it fresh, and make it to order every time. Their menu reinforces this by asking customers to please be patient because they make everything to order. Nina's takes social media by storm, frequently having giveaways and specials for customers such as "Bite Ball" and customer appreciation day which includes ridiculously low prices on their famous wing bites. There's no better feeling leaving work knowing I don't have to cook dinner and the whole family is going to have wing bites for next to nothing! So anyway, back to the pizza - Nina's serves both a round and a square pizza. The round is a doughier and a bit thicker round with a light amount of sauce and is topped with some signature burned cheese. 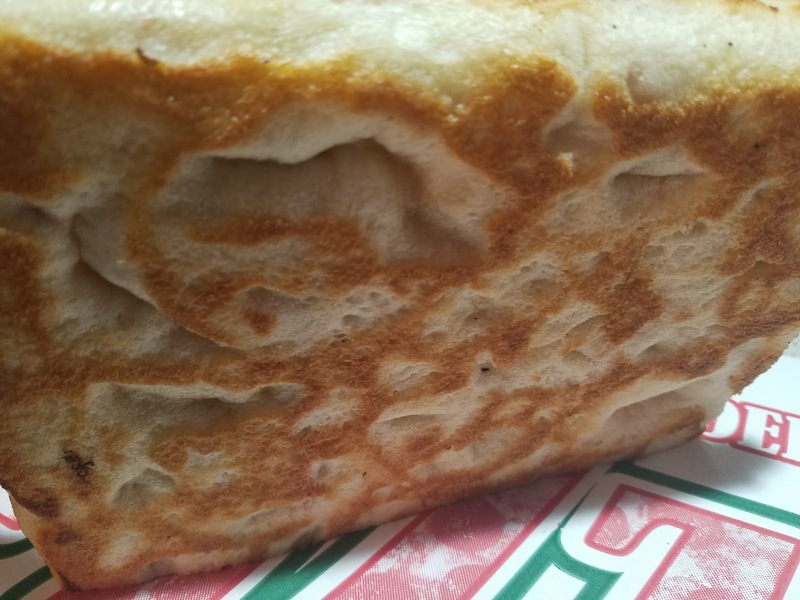 The dough is usually quite dense, doughy, and not crispy. It has shades of an Andy's or Angie's, but not quite as thick. 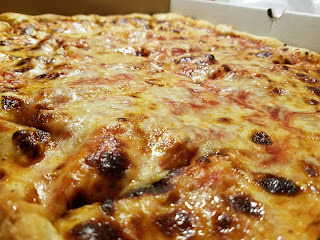 The square, which I'm reviewing in this article is really a hybrid Sicilian/old forge pizza in my view. The sauce and cheese screams old forge, and the crust is really a rectangular Sicilian. Like the crust of the round pizza, the square (rectangular) is also quite doughy and really soft. It's more like a breadstick than it it is a pizza crust. It's chewy and tasty. Nina's tends to go very light on the sauce, which I'm not a fan of so if I get the chance I ask for a little extra sauce to give it some more flavor and texture. It also adds a little moisture to a somewhat dry pizza. Absent the extra sauce, I find myself digging into the fridge for some leftover spaghetti sauce to dip the pizza in. The cheese is always browned on top, and for those who love burned cheese - this pizza is for you. 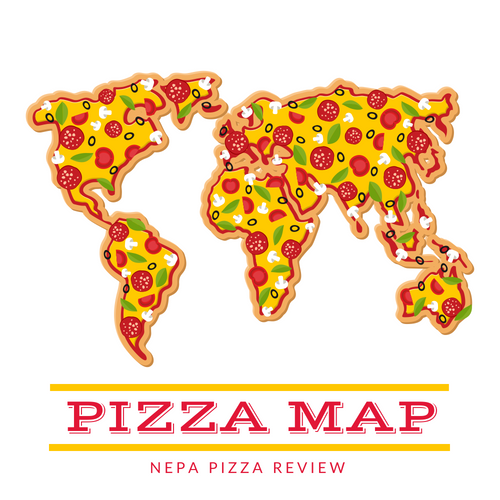 Overall, I am a big fan of Nina's as the pizza is always consistent and reasonably priced. It also has a fantastic shelf life, so it is the perfect pizza to take to a party or gathering. It refrigerates and reheats nicely as well. It's so nice to have another delivery option in Clarks Summit along with Rosario's, Domino's, and Fiorillo's.